CD Review: POLYSICS – Weeeeeeeeee!!! Japan’s notorious boiler suited techno-new-wave hooligans POLYSICS return with Weeeeeeeeee!! !, their latest high-energy album, scheduled to shatter the eardrums of the UK and Europe from 10th June courtesy of JPU Records. Following in the footsteps of their 15th anniversary release – which featured collaborations with a number of music legends, including the band’s personal hero, Mark Mothersbaugh of DEVO – Weeeeeeeeee!!! sees the acclaimed outfit return with a mighty 17 tracks packed with fractured punk rock, vintage video game sound effects and the refreshing and quirky charm that only POLYSICS can muster. To celebrate the release of the album, the physical version will come bundled with three exclusive bonus tracks not available digitally or on the original Japanese version. The band has also launched their official overseas Youtube channel ahead of album’s release, which includes the full videos to Weeeeeeeeee!! !’s catchy singles ‘Everybody Say No’ and ‘Lucky Star’, as well as the famous video to classic track ‘I My Me Mine’ – the first time the video has been officially available in this region. If you need something to perk you up and make you bounce around your living room, this is it. POLYSICS are back and they’re as crazy as ever! On the first listen through, I don’t think I was in the right mood and I thought for one awful moment that perhaps I had grown out of the infectious electro-J-pop sounds of POLYSICS; I was, after all, in a very different place when I first got into them and saw them live in 2007. Luckily it was just a blip though, and when I listened to the album again I was pogoing along the street as I walked to work! It’s not easy to pick one favourite tune from the album – they do blend into one another a bit – but the singles ‘Lucky Star’ (video above) and ‘Everybody Say No’ are probably my favourite tracks. ‘Why’ and bonus track ‘No Control’ are also pretty cool. When it comes down to it, I think POLYSICS are more of a live band than the kind of band I want to sit down and listen to at home, but this album is really upbeat and is great to put on when walking or trying to get things done at home. Fans of POLYSICS will love this, but if you’ve not heard of POLYSICS before be ready for something very quirky that I imagine simply wouldn’t appeal to everyone. This is not your average J-pop! Expect bizarre lyrics, sounds straight from retro computer games, and lots and lots of energy. POLYSICS, whatever you’re on, I think I’ll have some! Weeeeeeeeee!!! is released on 10 June courtesy of JPU Records. Pre-order your copy now from: Amazon UK (CD) (MP3), Amazon DE (CD) (MP3), Amazon FR (CD) (MP3), Amazon ES (MP3). POLYSICS burst into the British psyche when cult TV series Adam and Joe Go Tokyo introduced their music ten years ago. From there the group went on to inspire a generation, becoming one of the most established Japanese acts in the UK and even influencing the likes of a young Ricky Wilson, who would later invite POLYSICS to tour with his band, The Kaiser Chiefs. 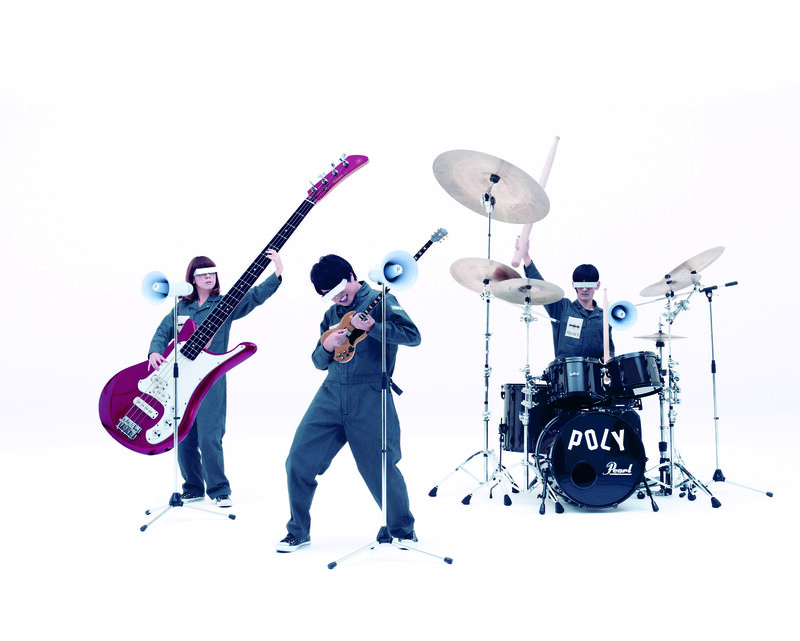 To date, POLYSICS have played a total of 99 shows in the United Kingdom – including main stage at the O2 Wireless Festival in Hyde Park. In their homeland of Japan they’ve played every major rock festival and recently conducted a headline show at the legendary Nippon Budokan (14,000 capacity). The group was also one of the very last bands to record a session for John Peel.